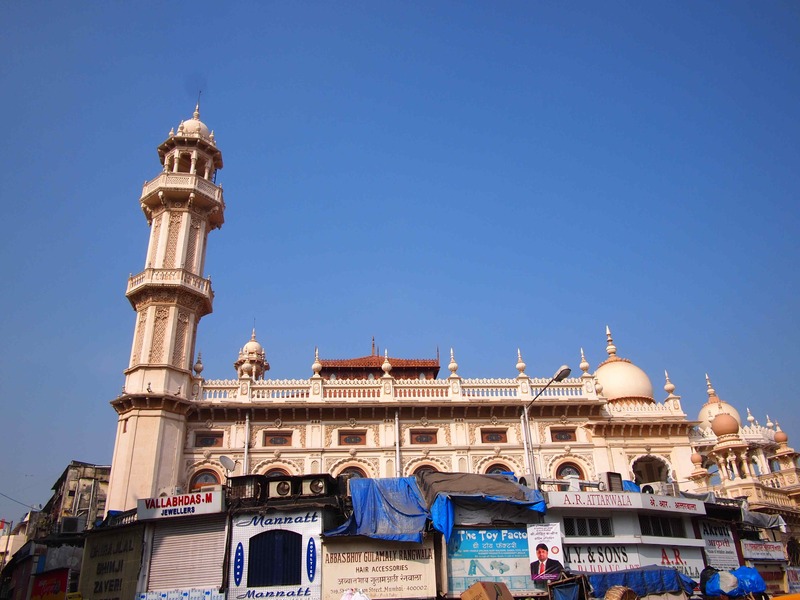 Crawford Market is one of those iconic places in Mumbai. You can buy anything here from fresh veggies to precious jewellery. 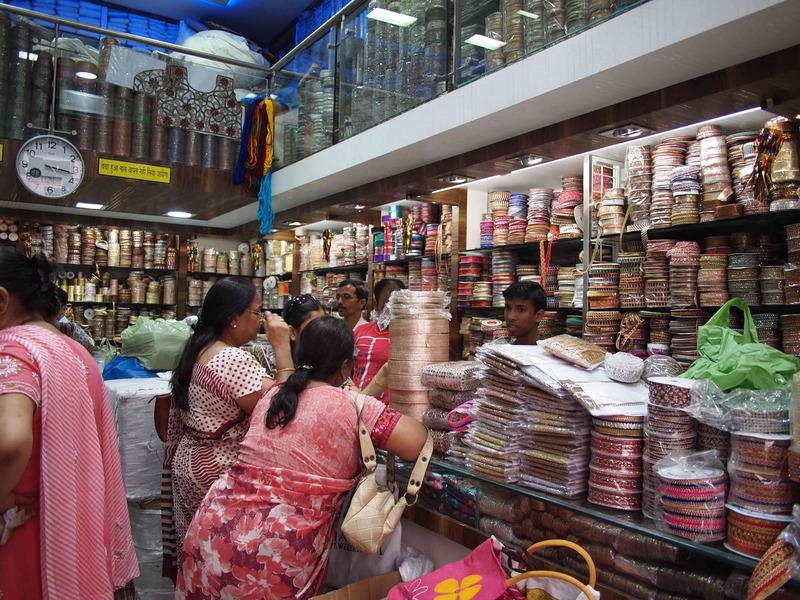 There are several different sections to the market that stretches out over several blocks, with different regions each specialising in specific products. we wandered down one of the streets and headed into the chaos. Our mission for the day was to search for fabric. 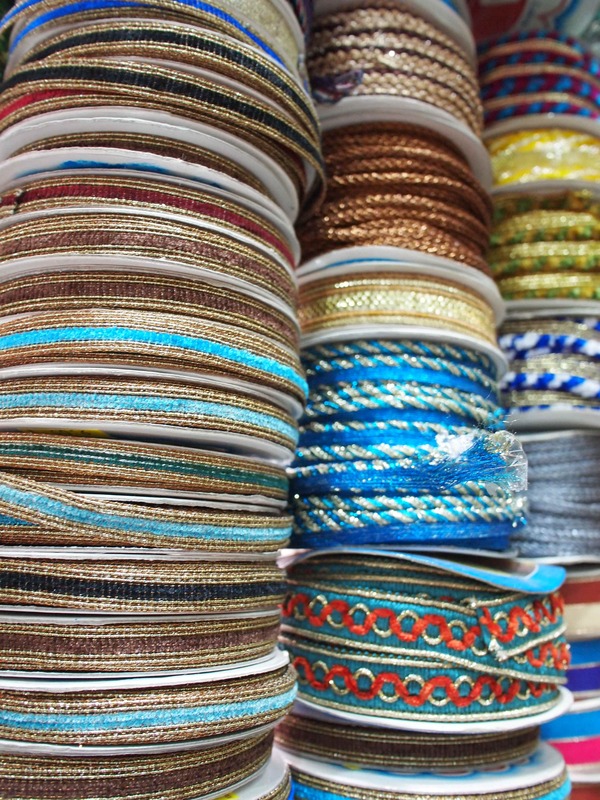 Initially we found jewellery, paper, home-wares and just about everything else you could think of. After a few blocks we started noticing a few fabric shops and then entered a narrow laneway, crowded with small fabric stalls. At the end it opened up into a large undercover bazaar crammed with row after row of fabric stalls. The photo just doesn’t do the space or atmosphere justice. Everywhere you looked there was just rows of fabric. Each stall had its specialisation, from glittery fabric to silks to cottons to salwar chemise suits ready to be made up. The choice was mind-boggling and quite overwhelming. Just finding a spot to take it all in and try and look at everything was hard. When a shopkeeper noticed that we were looking but were perhaps a little bit lost, soon rolls of fabric were being rolled out in front of us to choose from. Whilst this is a wholesale market, there are still plenty who are happy to sell small amounts retail. It really does need to be experienced to be believed. What amazed me the most was the choice. We went into a small shop that sold borders or edgings. To get an idea of just how much choice there was, this was about a quarter of the store. It took us at least an hour to choose the colours and patterns we wanted. Innocently I asked for a couple of metres of one roll and the store attendant just looked at me like I was an idiot. They didn’t sell by the metre, you have to buy the whole roll. So now I have some fantastic copper coloured ribbon… let me know if you need a metre or 5! Do you think I can find white beaded lace and bridal fabric for a western gown? You could find almost anything in the Mangaldas market, I’d definitely give it a go. ૯ મી ગલી !!! ગુજરાતીમાં !!! I will take 3 meters please!! 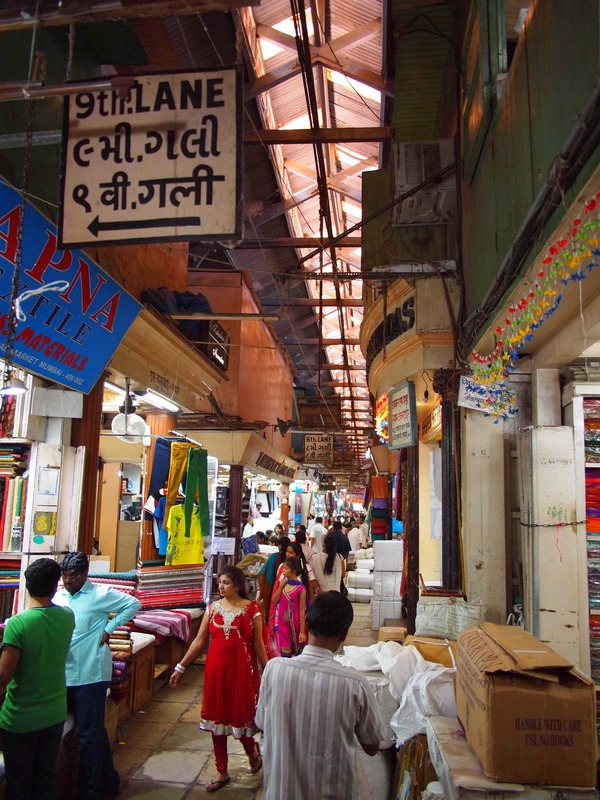 Just kidding, loved your post and need to get to Crawford Market when I am in Mumbai sometime. It seems I never do anything but pass thru Bombay on my way to and from the airport. But your posting is a good inspiration to do it and there is definitely way more choice then here in Goa…. Thanks Melanie. It is definitely worth heading to the market next time you are in town. Suzanne, I’m sorry but I can’t remember exactly where it was. All I can recall is that it was in a lane off the main road near Mangaldas Market. Hope that helps.